Rent The Curtis - A Doubletree by Hilton | Corporate Events | Wedding Locations, Event Spaces and Party Venues. 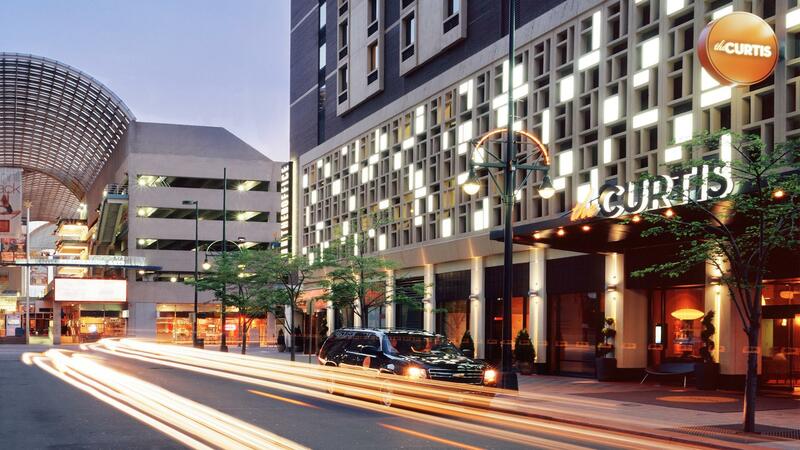 Our trendy hotel puts a fresh twist on retro pop culture, providing the most stylish venue in the heart of downtown. For a modern couple seeking a truly unique day, the Curtis has over 20,000 square feet of contemporary event space. Just because you’re in a meeting doesn’t mean you can’t enjoy yourself! From our tic-tac-toe notepads to our creative menus, the meeting rooms at The Curtis will make even the longest meetings fun. The meeting rooms are named after your favorite games from childhood. In fact, our creative approach to meetings got the attention of Condé Nast Traveler, who called us one of the best hotels for business in 2012. The Curtis has 27,779 square feet of event space that allows for 15 meeting rooms, including banquet capacity for 280 and theatre style seating for up to 400. We also offer a variety of technical assistance packages that will help you pull off that last minute meeting or the presentation that you have been perfecting for months! The Curtis Hotel in downtown Denver offers a fresh, fun, happy-go-lucky setting for events of all sorts. Whether it’s a corporate banquet or a private party or wedding, we have the staff, the catering, the location and the smiles to make it memorable. Faster than you can say “Knick-knack-paddy-whack” we can take care of menus, cakes, décor, place settings, chairs and more. We provide unique and innovative event opportunities for business events, private parties, reunions, receptions, and anything else you can dream up. Take advantage of our remarkable downtown Denver hotel location within walking distance to all of the fun the city has to offer. Make it an event people talk about for years to come at The Curtis.